Anthony's Science Blog » Blog Archive » How much carbon is stored in dryland soils? How much carbon is stored in dryland soils? Drylands are not known for massive soil carbon stocks like the Arctic tundra or plant carbon storage like tropical forests. However, drylands account for a large fraction of the terrestrial surface so they are still important when considering global carbon. Arid, semiarid and dry-subhumid ecosystems (drylands) occupy 41% of the terrestrial surface, and account for ca. 25% of global soil organic carbon (C) reserves. The methods for estimating carbon storage vary widely, and no single method is considered highly accurate…The 1m depth is appropriate for this analysis, but likely underestimates carbon emissions from deeper peatland systems. No global dataset of peat depth is yet available. The terrestrial biosphere reservoir contains carbon in organic compounds in vegetation living biomass (450–650 PgC; Prentice et al., 2001) and in dead organic matter in litter and soils (1500–2400 PgC; Batjes, 1996). There is an additional amount of old soil carbon in wetland soils (300–700 PgC; Bridgham et al., 2006) and in permafrost soils (see Glossary) (~1700 PgC; Tarnocai et al., 2009). So if we count the additional carbon stocks in wetlands or permafrost, it could reduce that percentage of global soil carbon in drylands by about half, to ~13% of the global total. 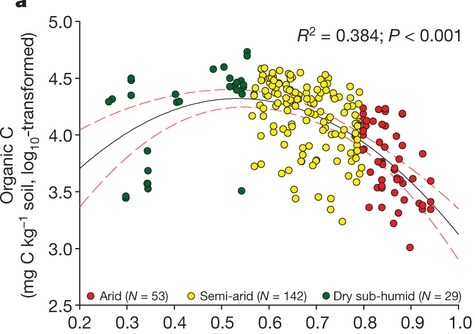 In conclusion, current estimates of 25% global soil carbon in drylands come from soil profile data and the limitations of those data include (1) they are not necessarily collected with consistent methodology and (2) they generally don’t include carbon deeper than 1 m. Depending on whether you count old carbon in permafrost and wetlands, the total percentage of soil carbon in drylands may be more like 13%, or half of what is often cited. However, because dryland carbon is near the surface, it may still be vulnerable to loss with climate change.